With war raging, 1942 was a time of uncertainty across the American landscape. A victory in World War II was no sure thing, and the economy was in the midst of a shift to wartime footing. The uncertainty surrounded contract metal stampers as well. Without a strong central voice, this sector of industry was at the mercy of Big Steel and customers alike. In addition, metal stampers had no ready means to interact to share common concerns or disseminate technology and process improvements. Against this backdrop, stampers discussed their options and by the end of 1942 agreed to form the Pressed Metal Institute (PMI). Organized in Cleveland, OH, and with 42 charter member companies, PMI evolved to become the American Metal Stamping Association in 1961, and the Precision Metalforming Association (PMA) in 1987. Recognizing its antecedents, this year PMA celebrates its 75th anniversary. Upon its founding, besides providing the means for stampers to communicate with each other and promote goodwill with customers, PMI sought to educate customers, suppliers and the general public on the advantages of stamping. In addition, formation of the institute was seen as a means to mutually study cost-accounting systems and the costs of manufacture, and “to improve and develop commercial methods in the manufacturing and marketing of pressed metal products,” according to PMI’s constitution. PMI also tasked itself with collecting and disseminating trade statistics and other information of value to the industry and the public; conducting research into markets; and handling trade inquiries. Just as is the case today, unfair trade practices received attention back then, as did efforts to promote apprentice training and make other attempts to educate and train those connected with or interested in becoming affiliated with the industry. PMI members worked then, as do PMA members today, to promote and protect the industry’s interests in public and governmental matters, and to secure adequate presentation of its problems before governmental, economic and business groups. After World War II, the metal-stamping industry grew, and likewise did PMI’s membership rolls and activities. PMI held its first National Technical Meeting in Cleveland, OH, on March 16-17, 1950, and also that year introduced its Blue Book of Stamping Manufacturers, a listing of all member companies distributed to some 15,000 purchasers of metal stampings. The book later became known as the Annual Stamping Buyer’s Guide. 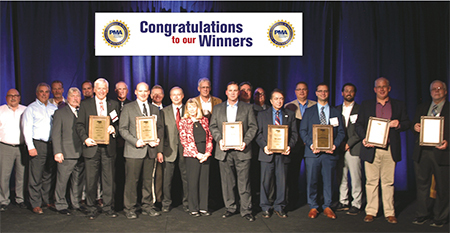 Each year through its Awards of Excellence, PMA honors companies that have gone above and beyond in key areas such as engineering, safety and training. PMA oversees four major networking groups, allowing members with similar interests to meet and discuss topics of relevance to their businesses. As a member of the International Council of Sheet Metal Presswork Associations (ICOSPA), PMA takes an active role in the ICOSPA Congress, held every three years. The association’s tradeshow, METALFORM, was held every odd year from 1981 to 1991, when it became an annual affair. In 2009, it became a pavilion in FABTECH, an annual forming and fabricating event. PMA, via staff, members, partner organizations and its own lobbying firm, maintains constant contact with regulators and lawmakers to make sure that member and industry concerns are heard and addressed. 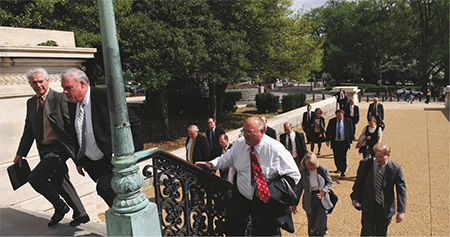 Here, PMA members, taking part in a fly-in, make their way to Capitol Hill. Growing out of informal meetings at association events, Women in Manufacturing was established as a separate organization in 2014. In 1951, PMI issued its first Industry Mobilization Survey, as well as its first Wage and Hour Survey. Another emphasis that year: international trade, as PMI officials visited England under the sponsorship of the Economic Cooperation Administration. In 1955, industry awards became a focus for PMI, as its Spring Technical Meeting featured the first-ever presentation of the John Woodman Higgins Redesign Award to engineers from General Electric’s appliance group in Louisville, KY, for redesign of integral back plates and a drain trough for GE’s combination refrigerator-freezer. The award, sponsored by the Worcester Pressed Steel Company, Worcester, MA, in memory of its founder, was created to recognize a metal stamper for excellence in product design. 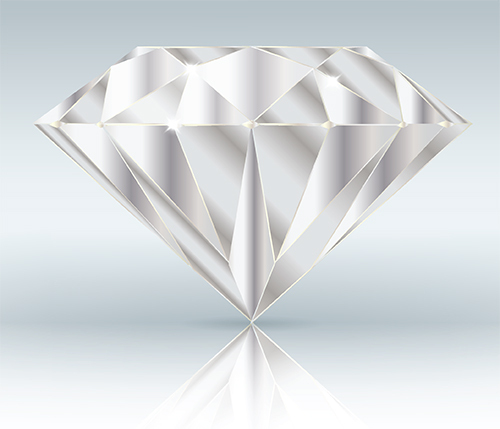 It lives on today as the Higgins-Caditz Design Award, one of nine awards presented annually by PMA. In 1961, Jefferson D. Keith became the association’s managing director, and PMI formally became the American Metal Stamping Association (AMSA) to more accurately describe the industry it served. Under Keith, increasing membership became the top priority, which at the time numbered a bit less than 200 companies. By 1972, membership would more than double. Also in 1961, AMSA incorporated the Small Lot Institute as a division of AMSA. That year’s annual meeting was notable for creating the association’s first networking group, the “20 Year Breakfast Club,” comprised of companies that had belonged to AMSA/PMI for 20 years or more. Networking would become part and parcel of PMA’s operations in coming years. Clem Caditz, owner of Northern Stamping in Chicago, IL, and one-time chairman of AMSA, had founded the Quarterly Club, a separate organization counting many prominent AMSA members among its ranks. Throughout the 1960s, the industry continued to grow, and so did AMSA’s presence, nationally and on the world stage. In 1964, the first International Study Team of 47 AMSA representatives toured plants in Germany, France and England, and then attended the First International Stamping Conference in England. In 1965, AMSA established a precedent by cosponsoring a two-day conference of Educators and Industrialists, at Kent State University. It established other precedents that same year when it participated in the National Safety Congress, and also marketed itself to potential members by reserving a booth for the first time at the ASTME (American Society of Tool and Manufacturing Engineers, now known as SME) Tool Show. Also in 1965, AMSA took first place in the 1965 National Idea Fair of the American Society of Association Executives. March 1967 marked the birth of AMSA’s industry publication, Metal Stamping magazine, which took the name MetalForming in 1988. Over the years, MetalForming has added digital components, including websites, e-newsletters and apps. 3D Metal Printing and Fabricating Product News have since joined the PMA publication roster, and the magazine group also provides webinars and live conferences and events. In 1969, AMSA hosted the Third International Technical Conference of Sheet Metal Working, at the Sheraton Hotel in Chicago. This meeting represented AMSA’s first attempt at multilingual, simultaneous translation as well as printing. Each program was presented simultaneously in French, English, German and Japanese. Today, as a member of the International Council of Sheet Metal Presswork Associations (ICOSPA), PMA takes an active role in the ICOSPA Congress, held every three years. Later, in 1981 at AMSA’s annual Spring Technical Conference in Cleveland, the association organized an exhibition in a hotel parking garage. That event marked the beginning of METALFORM, held every odd year until 1991 when it became an annual affair. 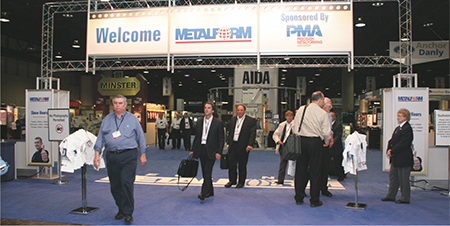 In 2009, the METALFORM show became a pavilion in FABTECH as PMA partnered for the first time with other trade associations on that annual event. PMA also now partners on FABTECH Mexico, an annual exhibition and conference. As a county economic development director, Bill Gaskin was brand new to the metalforming industry when he joined AMSA in 1977. Thrown into the fire, Gaskin had to learn quickly, and in his 40 years at the association, including the past 17 as PMA president, he’s had a chance to watch PMA, and the role of trade associations, evolve. 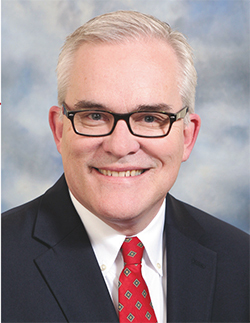 Over his time with AMSA and PMA, Gaskin has seen firsthand how communications have changed the association’s relationship to the industry. “When I joined the staff, we were in a transition from a very face-to-face operation where staff and members needed to travel and be together in local districts,” Gaskin says. 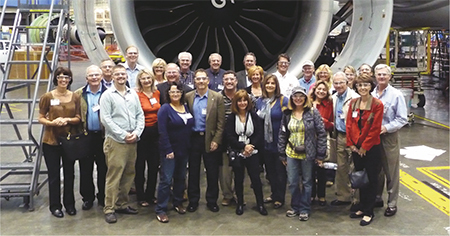 “We had 10 to 12 districts then, active groups that met seven or eight times per year, with industry suppliers traveling to district meetings to give presentations. That began to change in the 1980s and into the ’90s as communication and media evolved. Training is another area where PMA flexes its muscle. After 40 years, Gaskin gets a well-deserved break owing to his tireless service, and he’s grateful for the opportunity he’s had. He does plan to stay active in the industry by assisting the PMA Educational Foundation in its current capital compaign. 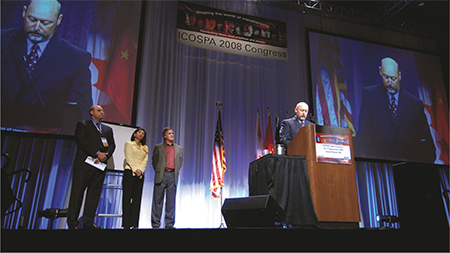 The 19th ICOSPA Congress will be held in Suzhou, China, this September, with PMA offering a Pre-Congress trip to Shanghai. The Occupational Safety and Health Act of 1970 propelled AMSA to focus intently on safety and generated increased membership as the industry became concerned with the impact of OSHA regulations. The association actively began educating members on OSHA regulations and stepped up its conversations with regulators. Association membership doubled in the early 1970s as a result. “OSHA made a huge impact in our industry, and led to rapid growth for us,” says Gaskin. Training in the metal-stamping industry also was emphasized by AMSA in 1971. A series of two-day workshops was held for key employees responsible for their companies’ compliance with the new safety regulations. In conjunction, AMSA compiled its first safety-compliance handbook. In 1972, AMSA broke ground for a new headquarters’ building in the Cleveland suburb of Richmond Heights, and the association’s technical meeting moved out of the United States for the first time, as more than 900 stampers met in Toronto, Ontario, Canada. 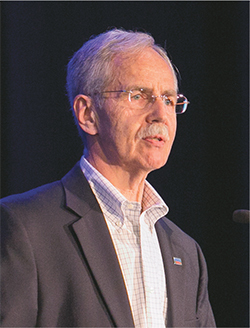 In 1975, Jon Jenson took over as AMSA president, focusing his efforts, and those of the 14-person AMSA staff, on the association’s Metal Stamping magazine, government affairs and industry statistics. Among the early moves made under Jenson’s direction was the creation, in 1977, of the AMSA political-action committee, primarily to support challengers and congressional races with open seats. The philosophy was to focus on change in order to elect a pro-business and pro-manufacturing Congress. The AMSAPAC became the Precision Metalforming Association Political Action Committee (PMAPAC) in 1987, before becoming PMAVIC (PMA Voice of the Industry Committee) in 1995. PMA’s lobbying efforts took on a particular urgency in the early 2000s. In 2004, recognizing the need to place an even greater emphasis on lobbying, PMA hired full-time lobbyists, and in 2008 joined forces with NTMA to lobby as One Voice for the metalworking industry. Along with Government Relations and other committees, PMA also operates several industry-specific divisions, including Metal Spinning; Washer Manufacturing; Slideforming; Small-Lot Stamping and Fabrication; Custom Rollforming; Tool and Die; MFG NXT; and, of course, Metal Stamping, the largest of PMA’s divisions. PMA has developed training systems for machine setup and operation, safety, dimensional variation, lockout- tagout, economic literacy, and new-hire orientation, with new web-based training on the way. Educating the industry always has been a major focus of PMA, and in the 1980s, the association went further by developing training aids using the prevailing media of the day. In 1988, PMA released its first video-based training system to train industry employees setting up and operating manually fed presses, and in 1989 a program was released for training on coil-fed presses. These have been followed over the years by training systems for setting and operating press brakes and metal-spinning machines, as well as a Spanish version of the coil-fed training system, and an updated version (in 1999) of the coil- and manually fed systems. Training systems also have been developed for safety, dimensional variation, lockout-tagout and economic literacy. 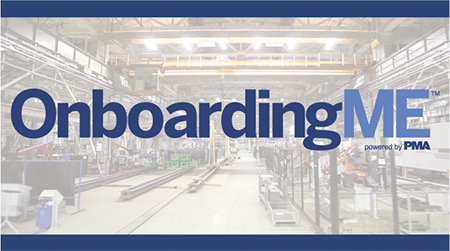 The association has followed these efforts with CD-based safety-training aids, and within the past year, PMA debuted Onboarding ME, a DVD orientation program for new employees in metalforming operations. Now, the association has undertaken a major effort to update training offerings via web-based programs. With a pedigree steeped in engineering, manufacturing and our industry’s workpiece metals of choice, Roy Hardy has assumed the leadership position at PMA as its new president, and is tasked with charting its future course. He looks to do that by emphasizing membership engagement, growing membership, promoting advocacy and continuing a commitment to technology transfer and training. A self-described third-generation metals man—his grandfather worked in a ductile iron foundry for 35 years and his father’s career was spent as a metallurgist at Huntington Alloys—Hardy has had a lifelong fascination with this type of work. “As a kid on plant tours where my dad worked, I watched metal being poured, twisted, bent and recycled to be used again…I’ve always wanted to be a metals guy,” he says. Graduating from the University of Cincinnati with a bachelor’s degree in Metallurgical Engineering, Hardy worked his way through nearly every link of the metal-parts supply chain, then owned a company supplying steel mills, the heattreating industry and forging companies. For the past eight years he has served as president of the Forging Industry Association. Recognizing that PMA’s effectiveness as an advocate is directly related to its size and strength, Hardy seeks an increase in membership in coming years and more engaged members. And, he sees PMA’s Educational Foundation as instrumental in helping address the skills shortage by raising awareness among the general public, and assisting and funding PMA’s efforts to deliver training via an online learning-management system as well as workshops and seminars. The association has pursued other training initiatives as well. For example, in 1993, PMA began work on creating a skill-standard credentialing system for all of the metalworking industry, which transformed itself into the National Institute for Metalworking Skills (NIMS) in 1995. In 1996, PMAEF was established to support and develop training and education for metalforming skills, and to improve the public image and awareness of careers in metalforming. It raised more than $2 million in an endowment campaign, the majority of which was pledged between 1997 and 2000. Since that time the foundation has made more than $1.5 million in grants to support its mission. Recognizing the growing number of females employed in our industry, from entry-level to management, PMA has sought to provide forums and opportunities for women to network. In 2009, PMA attracted 14 women to its inaugural Women in Metalforming gathering at FABTECH Chicago, IL. 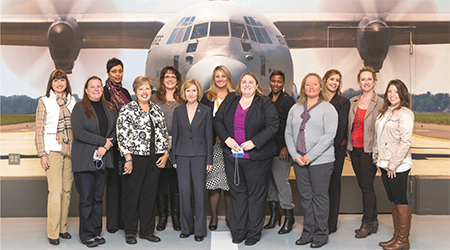 In 2011 the group supported the first annual Women in Manufacturing (WiM) event, held in October in Cleveland, which attracted more than 130 women manufacturing leaders who discussed best practices in manufacturing, mentoring, communication strategies and leadership. With this article, we’ve sought to recap 75 years of highlights attributed to PMI, AMSA and PMA. In truth, there is so much more. 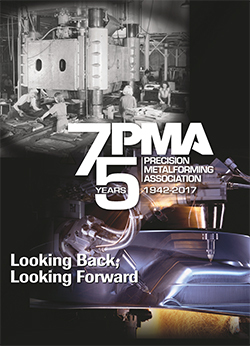 To read more on some of the association’s history, please see the July 2012 issue of MetalForming, which celebrated PMA’s 70th anniversary. It can be accessed at www.metalformingmagazine.com.